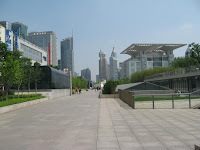 Shanghai is an hour train ride from Hangzhou. 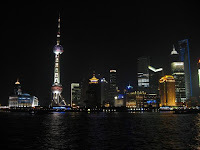 It's a very big city and crowded, modern, and in some way amazing. I wen to see all the main attractions, and 2 days was enough. 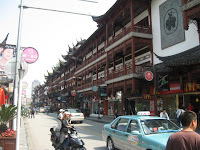 I went first the the old town, where are traditional chinese buildings - now all shops. I went and visited a old garden. Then I went to the so called french quarter, where there are of course french-built houses. 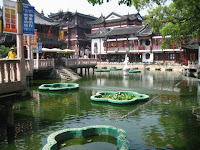 The main attraction on the city is the area around the river. 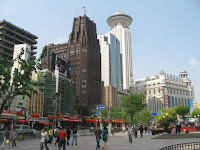 The east side is known as the bund. 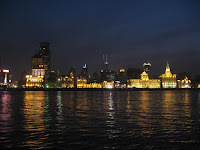 There are many buildings from 30', mainly banks or tradehouses, with european architecture. Around the city there are also many european looking buildings, from 30'. 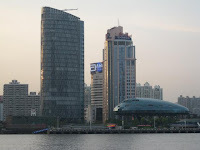 The other side of the river is full of modern buildings. 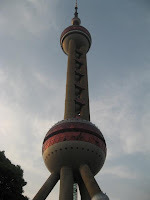 One icon of the city is the Oriental Pearl TV tower. 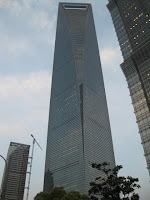 A new is the Shanghai Finance Center tower, the tallest building here (and 3rd in the world at 450 m), easy recognized by the shape with a square hole at the top. 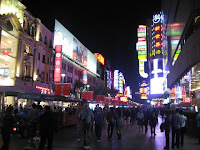 A well known area for shopping is the Nanjing Street East. In the end I stayed 5 days since my travel plan changed.